A flier promoting free legal help for those affected by President Donald Trump’s order could be seen at Logan Airport Saturday night. 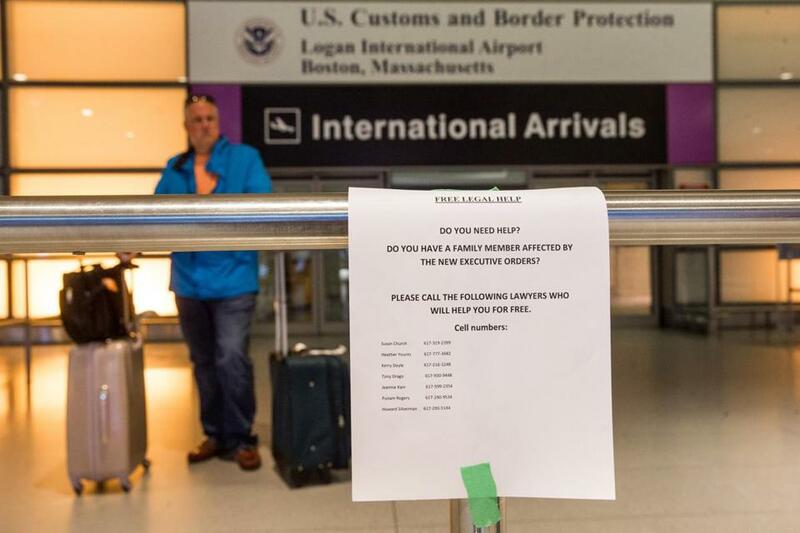 “We landed, let’s see how it goes,” Maryam Ghodrati said, reading aloud a text from her Iranian husband, Alireza, as she waited for him at Logan Airport’s Terminal E around 2 p.m. It didn’t go so well: her husband was detained by authorities nearly four hours. Ghodrati, a PhD candidate at the University of Massachusetts Amherst, said she is a naturalized citizen; her husband, a PhD working in the area, has his green card. Their 10-year-old son was born here, and the family lives in Hopkinton. She said her husband had returned to their home country of Iran on Thursday because his father had died. A day later President Donald Trump issued his controversial executive order blocking Syrian refugees and immigrants from seven predominantly Muslim countries, including Iran. “For two whole days, I was just sitting by CNN, listening to the news, calling the airports,” said Ghodrati. Worried about making it back into the US, Ghodrati said her husband cut short his trip and missed his father’s memorial. He flew from Iran to Qatar for a connecting flight to Boston. As of 5:30 p.m., Ghodrati was still waiting anxiously with her son, niece, and niece’s husband, standing behind a railing as they stared at a pair of double doors. Her husband was released at about 6 p.m. The couple embraced quickly and left without speaking to reporters. Earlier Sunday, an Iranian woman was detained for several hours at Logan after her flight arrived from Dubai, according to her lawyer. The woman, who has been legally living in the US, arrived on an Emirates flight from Dubai that landed at about 7:28 a.m., and was held for nearly three hours, according to her attorney, Howard Silverman. At about 10:15 a.m., the woman was allowed to leave the airport with her husband, who is also from Iran. Mark Arsenault of the Globe staff contributed to this report.